√Made of soft and cozy Acrylic Fibers, Eco-friendly and Skin-friendly perfect for kids. √Highly Versatile: The mermaid tails like a sleeping bag could wiggle your feet into the blanket and keep warm. Great to wrap on the sofa, couch, bed or car for reading, watching TV or nap sleep. √Handcraft: Crochet by hand, more exquisite and elegant, ideal gifts for girls and women, give them a warm and sweet leisure time. The blanket can be used all the year round. Protecting the leg temperature has the role of preserve one\'s health. √Slip inside and look and feel like a real mermaid! 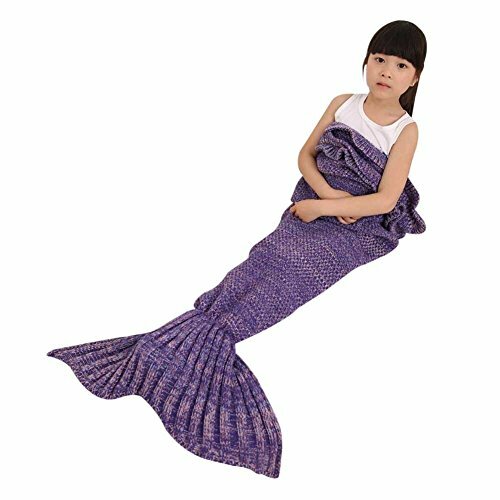 You can cozy it up to become a mermaid or give it to your friends as the best gift.